• PLOT SUMMARY: "Red Right Hand" - Meet the Red Hood and his sidekick Scarlet, Gotham City's vicious new 'protectors,' in the start of a new arc! This dangerous duo is out to destroy the very reputation and legacy of the Batman by replacing it altogether. Writer Grant Morrison (FINAL CRISIS) teams with hot new artist Philip Tan (GREEN LANTERN) to bring you what's sure to be the new Batman and Robin's biggest challenge yet! Written by Grant Morrison. Art by Philip Tan and Jonathan Glapion. 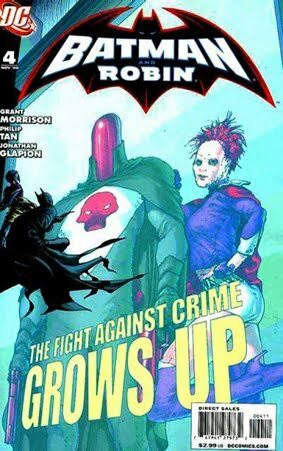 Cover by Frank Quitely.